For spring, there are lots of outfits available in the pastel or flower-color schemes! Perfect for spring events or trolling around with your RP friends by the new gazebo in Stormwind City. I thought I would start with one of the easier items that I have obtained, the Elegant Dress. 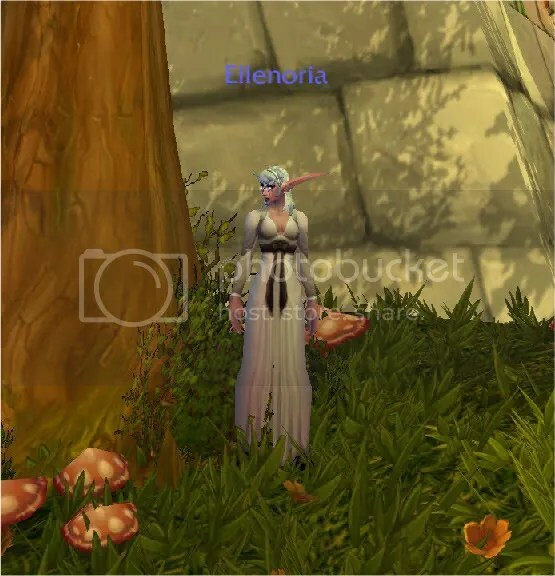 This is the dress that you can obtain through the Noblegarden holiday event around Easter time. To be honest, I haven’t used this dress much due to my dislike of the color pink. However, I found that when paired with my epic Lightweight Bio-Optic Killshades and the trendy Shadowy Laced Handwraps…. I looked kind of stylin. I am sure this could be debatable. 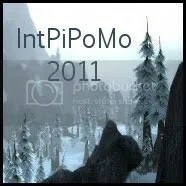 from Lunar Festival held in January-February each year. I paired my dress with the helm, Gossamer Headpiece of the Whale, which is the white version of the Scarlet Monastery Cathedral helm. I also threw in Officer’s Formal Baton, which is a Cata quest reward item. I was going for regal with a big stick I suppose. Some people spend too much money on RP gear. I am one of those people. 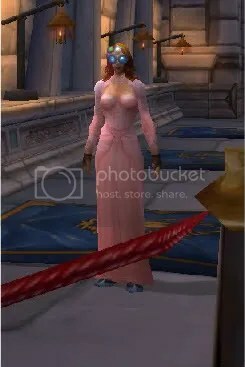 For example, let’s say you (or me) have failed to get the AQ20 hot pink robe since vanilla days of 2004. 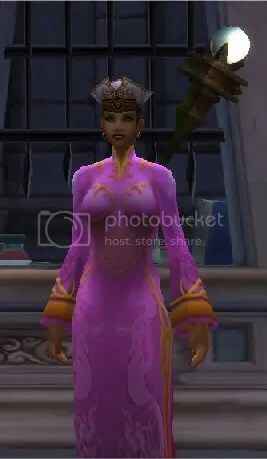 AND let’s say you (or me) have drooled over the similar dress Robes of Insight on the auction house since then as well. So why not just buy the AH version you may ask? Because even though they are a level 40 item…they still sell for between 500-1000g on most servers! Anyways, this dress does make a nice spring outfit, and it’s about as formal as you can get in game. I wish I had paired it with my bouquet of red flowers from the Valentine’s event. That would have been sweet! of Arcane Wrath. Someone gave me this as a gift a long time ago, but apparently it is a green drop that comes in level 30-40 zones. I picked this as a spring dress because of the blue and the slits up the leg. And the easiest dress to get of all is…. White Woolen Dress.Not only does this look simple yet beautiful on most females, it is a level ONE dress. So anyone can wear it (including men if you really wanted to- hey, I have seen it done!). It is a crafted tailoring pattern that only takes 3 bolts of wool to make. Would go well with Red Rose offhand. It’s always more challenging to come up with some outfits for the guys, but believe it or not… there are spring shirts! 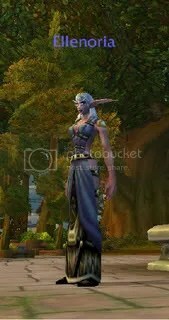 May I first please nominate- Lavender Mageweave Shirt! Here it is on my rogue paired with his regular gear brown hat and some cloth brown boots. Also paired with Tuxedo Pants, which go well with anything. 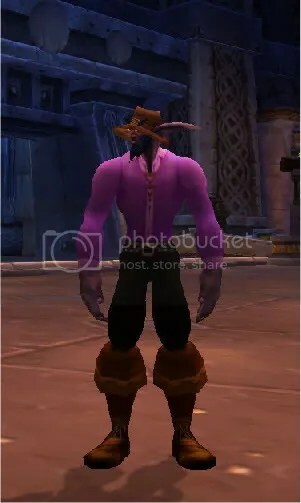 There is also Pink Mageweave Shirt for the brave-hearted man! Hey, cause everyone wants the Miami Vice look again. These shirts and the pants are all tailoring patterns that not every tailor these days has, but they are out there. Better to have them crafted if you are on an RP server than buying them on the auction house, or you will pay far too much. ***I will be posting more RP outfits in the future. 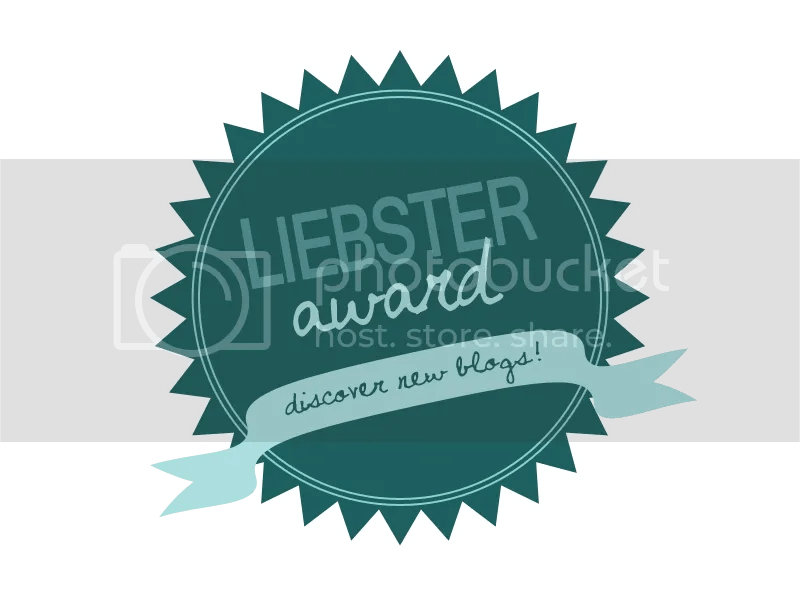 Please leave comments about this post- I had a lot of trouble making it since I am new to wordpress…. but also leave me feedback about what kinds of outfits YOU would have listed as spring RP wear. Thanks for reading! 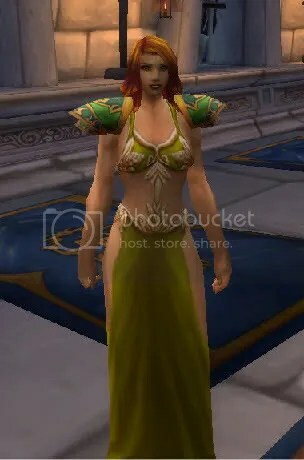 I really want the AQ20 robe for my nelf druid. I don’t play on an rp server but I still like to dress my toons up when I’m in SW. My fave head piece is the crown from the midsummer event. As for spring outfits, I’d wear something colourful like the big voodoo robes (leather, but there should be a cloth look-alike somewhere) or it’s yellow and brown recolor, the Watcher’s robe. Or perhaps one of my personal favourites, the red and yellow Simple Robe. I believe the cloth version of the yellow/brown is Brightcloth Robe…I have a screenshot of it somewhere.